art pilsen: Little Village Arts Fest this weekend! Little Village Arts Fest this weekend! A weekend of FREE art exhibits, workshops and performances in Chicago's Little Village neighborhood. 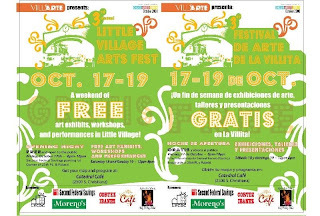 Due to weather conditions for Friday October 17, the Little Village Art Fest Opening Night has been moved to Catedral Café. Music, performances and much more!!! Local artists and art organizations and collectives from the Little Village neighborhood join forces to organize the 3rd Annual Little Village Arts Fest. Having no formal gallery or performance spaces, local bussinesses, community organizations, and schools donate their space, so the artists can transform them into gallery and performance spaces. This year there are 14 spaces and our opening night will be on Friday, October 17th at Catedral Café 25th and Christiana Ave. Artists hope to have a peaceful weekend filled with color, music, and art all over Little Village, to give local artists the chance to exhbit and perform in their own neighborhood.